Hong Kong is my new favourite city. Which is kind of surprising since the reviews I've heard about it haven't been wholly positive. And yes, I guess living there would be pretty hectic, but from my four days in Hong Kong I have concluded that Hong Kong has everything: awe-inspiring crazy high skyscrapers (including the sixth and eleventh highest in the world) and a central commercial hub; lovely narrow steep streets with cosy cafes and funky bars; crazy posh shopping centres; crazy affordable street markets full of all that adorable junk you (don't) need; peaceful, natural, beautiful islands a 20-minute ferry ride away. However, that may just be due to the exceptional excellence of my host, James, and his knowledge about the various places to go. The high lights. ;) See what I did there... The lit-up, colourful skyscrapers. Often I felt you had to keep your camera on portrait mode because they wouldn't fit heightwise into landscape. The views were especially fabulous from the star ferry, a two-minute commute from the mainland to the island and back. It was all Christmassy too. 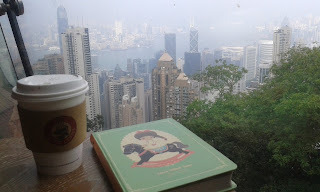 Victoria Peak. A popular tourist attraction – you go up it in a tram whose training probably included climbing vertical walls, the route was so steep. It was epic. The view was awesome though a bit cloudy. It says 'Emma's Childhood Trojans'. Analyse. Amused, I remarked another cliché, a solo-traveller writing in his travel journal, all dark brown and leather and I think he was writing with one of those old fashion inky pens (I'm not sure, it may've just been part of my impression of him), and I felt like a very inferior and silly twenty-something writing in her cheap Chinese bad-English girly notebook. Anyways, a little later he ended up at the same table as me, and we started chatting, and I got my first travel friend, a very unlikely one at that. He was probably in his 40s, a computer science teacher from Turkey. Very chatty and no-fuss, and I felt intellectually advanced (for the first half hour) when we discussed the differences between the Turkish and Tatar languages. He asked if I want to join him to explore some of Hong Kong's famous markets. My gut thought was, as always, was 'errrrr, no', but I am proud to say I have managed to often silence my gut thought, and I decided why not? The plus (and minus) side of this is that Turkish computer scientists are rarely into the same kind of souveniry junk I am into, so I guess that saved me some money! Again not necessarily a highlight, but I found new admiration for expats living in, for example, Hong Kong purely because of the Chinese symbols. I feel I get it so easy in Vietnam where the alphabet is essentially same as in all the other languages I know. One evening in HK I had high ambitions to go and eat and one of the local places near James' place, but got so intimidated by the foreign symbolness of it I just went home and had toast. Lazy mornings, especially when James's star of a housie R made pancakes and had some lovely chats. It was nice having a 'home' before commencing two weeks of hostelling. Strawberry daiquiris with cocoa powder on the edges at this hidden bar in the Lan Kwai Fong area. Literally, it was just a pair of windowed doors with nothing written in, and to get in you had to knock and a lady would open the door for you. Inside, it was cosy, crowded and the daiquiris were absolute beauties of drinks. Coating cocktail glasses with cocoa powder seems to be a thing in Hong Kong. I'm not complaining. Dimsum - think of it as the Hong Kong version of Spanish tapas - bits and pieces of food you order and share with your friends. The best were the pork buns (also to become a tradition on this trip) - unfortunately no photos of it though. Highly recommended though! High views from the high lights. From James' place and especially his friends' balcony on the 20th floor. Awesomeness. Lamma Island. A little fishing village a twenty minute ferry ride away from Central Hong Kong. The trip there was beautiful – river, mountains and skyscrapers, what else can you want!? These buildings have holes in the middle so the dragon that lives on the mountain can always have a view of the sea. True story. Well, we went swimming still and are still alive, so hooray! Apparently real pufferfish... just a bit dead. A bit disgusting.